There isn’t a person who would say that Hyderabadi Dum Biriyani is not delicious. And, in case you do come across a person who makes you quite angry by claiming that the Biriyani that is served in Hyderabad is not up to the mark, please understand that he or she has not been guided to the best restaurant in town. However, when you visit Hyderabad with your family and friends, you definitely do not want to look like a chump by quoting ill of the Hyderabadi Dum Biriyani when you get back home, right? If this is your motive, then you must be aware of the places or the restaurants that you should visit when you are in Hyderabad for a tour of the city. In case, you do not know the names, this article will point out the best hotels in Hyderabad that serve one of the best Hyderabadi Dum Biriyani in the world! 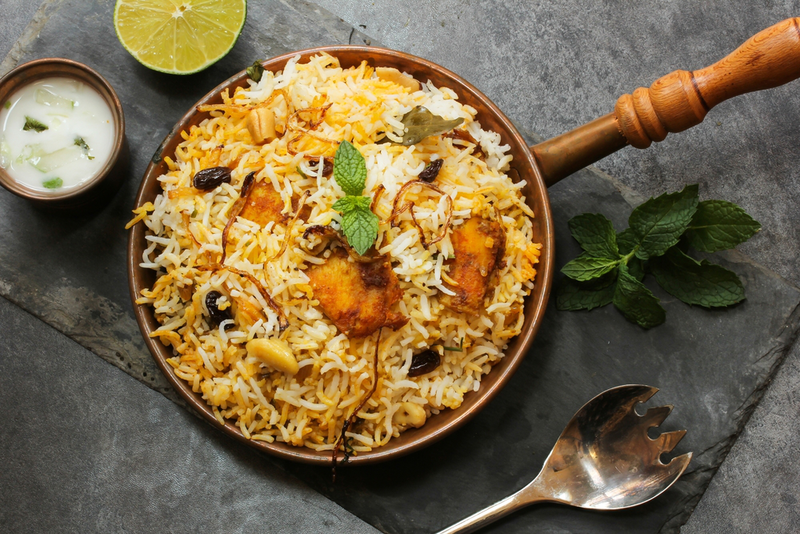 So, the next time you visit Hyderabad, you won’t have to surf through the websites of Yatra, Zomato, and others if you can manage to keep a note of these top 5 places that serve the best Biriyani in Hyderabad. Hotel Aadaab Bawarchi Qahna Restaurant:When it comes to traditionally tasting the traditional dish, you have to let your nose take the lead and not your eyes. When you look at the dull signboard and the rush of people going in and out of the restaurant, your first impression might be to run away to a restaurant with a cleaner environment. However, if you walk into this traditional restaurant, the aroma of food will lure you to have a hearty meal. Be it starting the morning with a cup of strong Irani Chai enhanced with the crispiness of the Osmania biscuits, or a perfect meal comprising of the traditional Hyderabadi Dum Biriyani and, tender and juicy mutton side dishes, this restaurant won’t ever fail to surprise you with the perfect taste of Hyderabad. Hotel Shadab:Hotel Shadab has always been an amazing choice for the local people of Hyderabad. The name of this restaurant has spread far and wide by word of mouth since the last decade. Moreover, the most amazing thing about this restaurant is that even if you’re a second-time visitor after 10 years or so, you will find no change in the taste and aroma of your favourite Hyderabadi Dum Biriyani. Shah Ghouse Café:The Shah Ghose Café is one of the best hotels in Hyderabad that serves the authentic Hyderabadi cuisine. Though there have been many competitors over the years, this traditional restaurant has nevertheless managed to surpass the standards of the other restaurants by maintaining the same taste of the traditional dishes for over 50 years! Hotel Sohail:Of the best hotels in Hyderabad that serve the authentic Hyderabadi Dum Biriyani, Hotel Sohail is an exceptional restaurant that draws the families together. The homely environment and the cleanliness of this restaurant compared to the others make it one of the favourite Briyani hubs in the city. Thus, Hotel Sohail has kept its reputation standing sturdy over the years by serving the authentic dishes at a reasonable price in the heart of Hyderabad. Café Bahar:Though this restaurant looks unclean and is always buzzing with people, the aroma of food would definitely not fail to lure you into the restaurant. With the various options available in the segment of the authentic Hyderabadi Dum Biriyani, visiting Café Bahar will surely be worth it. Plus, when you try out the mouthwatering side dishes, you will definitely forget the fact that you’re on a diet! In the heart of the city of Hyderabad, as these restaurants prepare your favourite Hyderabadi Dum Biriyani, why don’t you plan your next trip to Hyderabad so that you can enjoy the same delicacy?